The Compact Sectional Door by Remax sets new benchmarks for flexibility, space efficiency and architectural aesthetics in your car showroom or garage. When design flexibility, clean lines and quiet operation is a priority in your site, the Compact Door ticks all the boxes. Compact by definition! Clever by design. Space saving and Energy saving operation. The Compact Aluminium Sectional door is the premier alternative to roller shutters, or conventional sectional doors. The Compact door is a sectional door which needs no intrusive overhead support rails to be attached to the roof structure, and utilises a unique concertina folding action to push the door leaves into a compact space above the doorway. The door leaves can then be recessed into the ceiling for a clean flow from one area to the next. The Compact Sectional Door has been also successfully been recessed above acoustic panels and ceiling tiles so that the door bulkhead is totally out of sight - our installation team are experienced at working with builders and architects to install compact sectional doors during construction to allow for ceiling tiles and other recessed units to be fully completed post door installation. A Compact Sectional Door asks for a very clean and small footprint on the overall design of your facility. Please watch our Testimonial from Kilmore Toyota, the second video to your right or click here. The frame around the door panels can be powdercoated to a colour of your choice. A common colour is black - where the door frame sections line up with the horizontal lines of glass sections on the building. We also recently installed a glass compact door where the glass panels had a design painted onto them in a 3D paint to match a design painted into the building and the glass panels were inserted into the frame during installation. Compact Sectional Doors have been successfully implemented in various environments including luxury apartments, private residential homes, private car showrooms, commercial car showrooms, factories and warehouses, cold storage, wash bays, processing lines, emergency department including Ambulance and Fire Department, arenas and pavilions, loading docks, marina's, large agricultural buildings and depot. Compact Sectional Doors are made bespoke to your environment and entry, in both panel requirements (whether you require panels that are; thermal, PVC, double-glazed acrylate/polycarbonate/reinforced safety glass, mesh) as well as the opening size, from your average garage door opening size to a large warehouse requiring access for heavy machinery and vehicles such as aeroplanes, cranes and Fire Engines. Compact doors comply with the highest standards and safety regulations and the door is safe and easy to use. 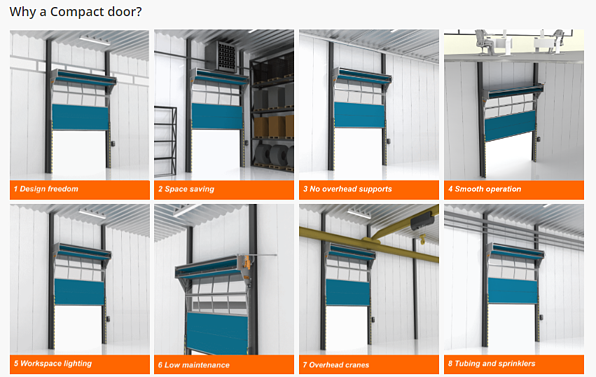 With no counter-balancing springs, the Compact Aluminium Sectional Door operates quitely, with minimumal level of maintenance in contrast to conventional overhead doors and rollershutters. 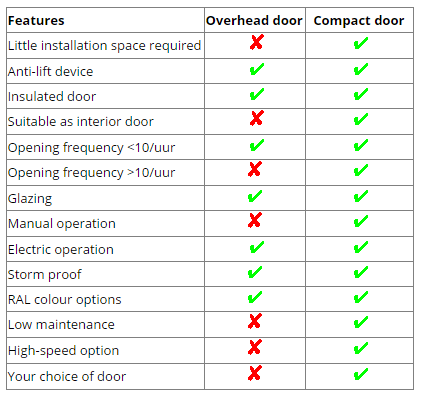 >> Download our comparison leaflet, The Benefits of a Compact Sectional Door, outlining the differences between a Compact Sectional Door and a Standard Roller Shutter and find out how it can make all the difference to your site. 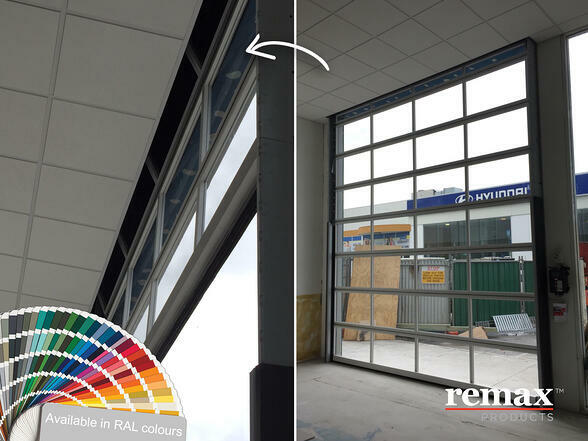 Seven glass Compact Sectional doorsinstalled at the newly redeveloped Prestige Sports Car Dealership in Victoria. Fifteen Compact Sectional doors installed at Kilmore Mazda - just an hour from Melbourne’s busy CBD, Kilmore Toyota have vast experience and insight into new Toyota car sales and repairs for both city and country drivers alike. Four glass Compact Sectional Insulated doors installed at Wagga Motors New Car Showroom in Victoria. Compact Sectional Doors at Fruit Packing Plant in Victoria and the importance of insulated doors. Compact Sectional Doors at Warrnambool Mazda State of the Art New Car Showroom and the Compact Sectional Door which matched to up the architects specifications, includingthe need for a smart appearance, high speed operation, natural light and Compact Design. 1. Good quality components needed for the robust installation. 2. Clean lines of the finished product. 3. Thermal insulation maintained for the installation. 4. Proven product support from a company with a long standing history with Geoffrey Thompsons.